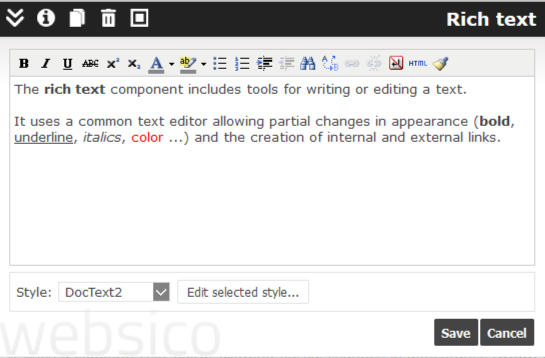 The rich text component includes tools for writing or editing a text. It uses a common text editor allowing partial changes in appearance (bold, underline, italics, color ...) and the creation of internal and external links. Changes in text or aspect appear on the page itself (wysiswyg) when clicking in the text area of the interface. Tools for editing appearance should be used if they apply only to a portion of the text, otherwise it is better to change the style of the element. HTML : Displays the source code of your rich text and allows editing. CAUTION: knowledge of HTML is required! Cleaning the Code: You can clean the source code of your text while preserving links. Indispensable when importing text using copy / paste. Useful also in visual behaviour inconsistent within the elements that follow the text: html code error can cause aberrations in the rest of the page.